Deer skulls are museum quality replicas. Cast in durable Polyurethane resins. Made in USA. 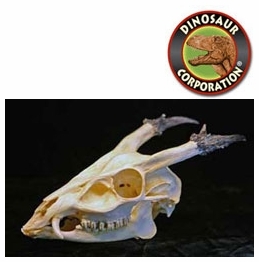 Asiatic Mouse Deer skull, Chinese Water Deer skull, Chinese Water Deer skull, Reeves Muntjac Barking Deer skull, Reeves Muntjac Deer, Tufted Deer skull, White-Tailed Deer skull, Doe. A deer is a ruminant mammal belonging to the family Cervidae. A number of broadly similar animals from related families within the order Artiodactyla (even-toed ungulates) are often also called deer.